Toyland is my place. I love coming here so much that it hurts. Brace yourself. One Monday, I really wanted to decompress (with the help of alcohol) after work in the bar’s funky yet chill atmosphere. Imagine my disappointment and consternation to find that Toyland is closed on Mondays! Monday is when people need drinks the most! In any case, I just love Toyland. It helps that I watched as it opened, one of the first now popluar joints on the less populated end of H Street. I feel a bit of pride as they added hot food to the menu. Aww, they got a stove–yay! No disrespect, Toyland, I’m just so proud. The drinks are where it’s at. 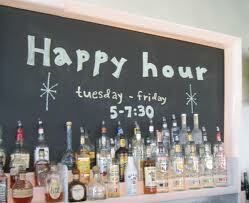 Happy Hour runs Tuesday to Friday, 5:00-7:30. Cocktails on the menu are $5 and have all the vim and whimsy one could expect walking into a place with a sixties feel and Blondie coming out of the speakers. For beer drinkers, Toyland offers $2 PBRs and $3 Yuenling. There is a bucket of four up-there beers (Purple Haze, anyone?) for $15. My favorties are the cocktails, however. The Cherry Pop (black cherry vodka, lime juice and Coke) tastes like what I wish Coke really tasted like–syrupy and sweet with a bite–and the DC Mule (pear vodka, lime juice, pineapple and ginger beer) is refreshing and tangy. I would probably never have tried the DC Mule if a very gregarious lady had not sat down next to me at the bar one day and insisted that it was the best drink she’d had in DC. Then she told me where to get good ginger beer in the city and how much of it she keeps on hand at a time. Needless to say, the atmosphere is very friendly. Friendly and accessible. Neighborhood regulars wander in around 6:00 and things pick up. Heartfelt handshakes and hugs all around. I suppose it could be like Cheers, if Cheers took place with a James Brown and Janis Joplin soundtrack. The food is excellent for dinner or just for noshing. But I stick to my story: the drinks are the main draw. The drinks and the atmosphere. Go, you will love it. Toyland is at the corner of 4th 5th and H, NE. It’s a short walk from Union Station and New York Avenue metros. Chloe knocks another one outta the park. Toyland comes highly recommended. a fantastic place with awesome ambiance, great drinks and a friendly staff. and not to undermine our lovely blogger, but it’s actually at *5th* and H.
jkc, don’t forget to give us the scoop on the “new” Toyland.